Sensor that works underwater BOOM! 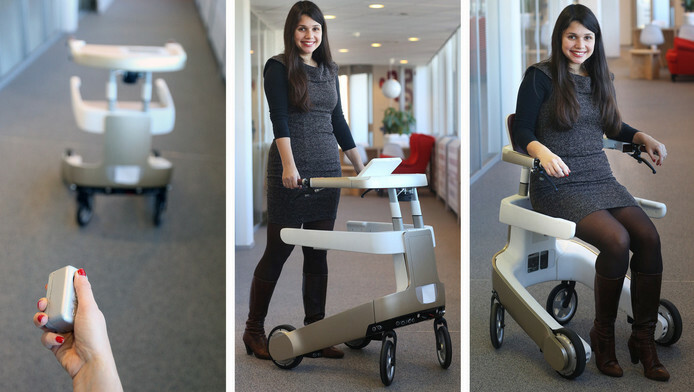 One of the most knowable events in techno industry that is called CES was held this month. During the event we were presented lots of new upcomings, and most of them we won’t see in the next years. During this event a new display hardware was presented. Sensel has introduced a new presure-sensetive display that can work under the water. It has developed technology based on force touch. It identifies not only where you press your phone but also the power of pressing. Moreover, it can measure a lot of touches at the same time. 1. Using it during cooking process. You must be rid of when you are cooking a dish, cleaning some tableware and accidentally someone is calling you or writing you a massage, so you are tying to answer, but your hands are wet so your phone dosen’t obey you and waits till you use a towel. 2. Wearing gloves. With this technology you don’t need to buy special gloves with completly ridiculous prices or to take off your gloves every time you want to change your music. It really makes your life better. 3. Making a selfee under the water. Although it has a lot of features that are usefull, there is one thing you should take into consideration. In my opinion, it will defenetly react on rain, that is why, this screen almost completly unables compfortable usage under the rainfall. But if they envisage it, the display must be a perfect solution for all top sensoric gadgets in the world! In Dubai the first rotating skyscraper: reality or fantasy? We can view Dubai as the home of many man-made wonders: we can find the largest artificial island in the world, the largest shopping center in the world, the tallest building in the world. However, some extravagant projects have never been realized and we do not know if these will be realized. These include, for example, the International Chess City but the project was quickly shelved, we can mention also the Dubai City Tower, a 400 floor mega-scraper, or we can still remember the Anara Tower but the project was shelved soon after. We do not know if in this list we can also insert the Dynamic tower by David Fisher. This project, first announced in 2008 before being put on hold, nowadays was rekindled. According to the ‘‘daily mail’’ the Rotating Dubai skyscraper will be built in 2020 and will allow guests to turn their rooms to 360 degrees. It will host a hotel and sky villas where residents will have also a car parks on each floor. As we have seen the idea is by architect David Fisher. In fact, a few years ago, he thought that looking out of the Olympic Tower in New York from a certain area of the tower you can see both the East River and the Hudson River but turning the floor, everyone could see them. What seems like a science fiction theme could soon become a reality. This is a tower 400 meters high that can change its shape according to the wishes of the occupants. In the skyscrapers designed by the Italian-Israeli architect David Fisher there is nothing of static: thanks to particular construction techniques these should be able to move and constantly change their shape. For example, to follow the movement of the Sun or wind or, more simply, to offer those who occupy them always new landscapes. Basically, each floor of these towers is autonomous and can rotate on itself 360 ° regardless of what happens above or below. The result is that, seen from the outside, these skyscrapers are real sculptures hundreds of meters in continuous movement. How would it work? 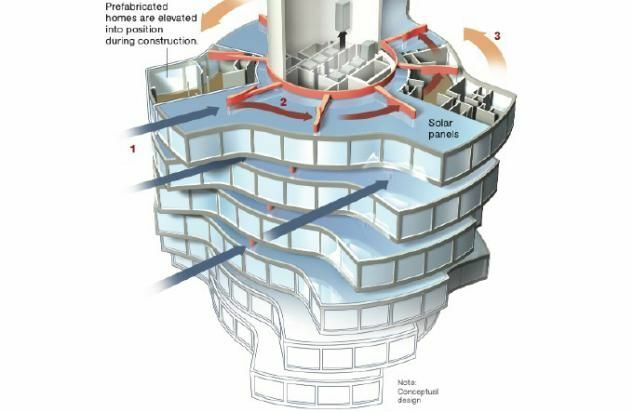 According to Mr. Fisher, each apartment would be able to rotate independently of 360 degrees, with adjustable speed. The floors will rotate at a speed of 6 meters per minute: a complete rotation will take 180 minutes. The construction of these futuristic buildings uses innovative technologies: each floor of the tower is a set of prefabricated modules that are built inside factories with industrial processes. It is green because it will use the energy of the wind and the heat of the sun to produce useful energy. As we can see from the picture before, a fixed core would be built containing the elevator, with the apartments connected to the center. All the systems, the subdivision of the internal spaces and the finishes are made previously in the factory and customized according to the indications and wishes of the customers. After that the modules must be assembled together, overlapping one another and hooked to the reinforced concrete supporting structure, which houses all the mechanisms necessary for rotation, the elevators, the stairs and the central systems. Therefore, it should be the world’s first prefabricated skyscraper, where individual units will be built off site, including hydraulic and electrical connections, before being hung from the central core. Aluminum, steel and carbon fiber should be widely used for the construction of the modules: thanks to these lightweight and resistant materials and to the construction technique, the dynamic high-rise buildings will have a high seismic resistance. But not only, they can also be built with less manpower compared to the traditional building and 30% faster. 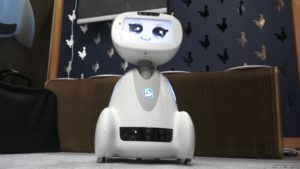 According to the project video, residents would get a series of views because the room would rotate slowly during the day and could be controlled by the voice command. Thus, they will be able to control rotation speeds and prevent their apartment from rotating with voice commands. They can decide when and how to rotate. Furthermore, the interested aspect is not only that the Fisher’s Rotating Tower project is innovative in design and architecture, but it is that recognizes the attention to the environment and the industrial production process as key points in the city of the future. In fact, the towers will be equipped with wind turbines positioned horizontally between each of the rotating floor and the other and with solar roofs that will guarantee to each floor, and therefore to the whole building, the total energy autonomy. “It’s a green power plant, it will power the whole building,” said Fisher. More, he add that they could generate up to 1,200,000 kilowatt hours of energy each year. Solar panels should cover the roof and the top of each floor. The skyscraper will therefore be completely self-sufficient from an energy point of view, so the inhabitants will not have to worry about the electricity bill. Solar panels will be installed on the roof, and 48 individual wind turbines will be hidden in between the floors to provide power. According to the architect, the building will generate up to 10 times more energy than it will use. We must consider that the project is not very current (it should have been completed in 2014) and that it is not certain that it will be realized by the year 2020. Despite the modernity of the city of Dubai and the already present majestic works, this invention generates many doubts and perplexities. Moreover, we have little certainty about its realization. Details on when the project could start and where it could be located have not yet been provided. Finally, the price. According to Futurism magazine, Dubai tower is expected to cost around £355 million. Furthermore, this plan provides for the construction of similar buildings in cities such as London, Paris, New York and Moscow. But how many people could afford an apartment like this? Could this ambitious project become a real work? Now skepticism prevails: the project still looks like a “vision of the future” rather than a real construction plan. We should not be surprised if then in a not so distant future in the biggest cities we could admire buildings like these. Tesla, the company defined by Forbes as the most innovative in the world, is ready to transform our homes into small, autonomous power plants. Tesla, the company founded in 2003 by Elon Musk and JB Straubel together with Martin Eberhard and Marc Tarpenning and operating until just a few months ago, exclusively in the sector of high performance electric vehicles, is experiencing an exponential growth so much that it has been praised by Forbes , already in 2015, as the most innovative company in the world. Just in recent months, the company is entering a decisive and revolutionary way in the field of electrical engineering and renewable energy, especially the solar one. The story began towards the end of last year, when Tesla announced that it will collaborate with Panasonic for the production of solar panels and modules. The two companies signed a so-called “non-binding letter of intent” under which they will collaborate in the production of photovoltaic cells (PV), located in Tesla plant in Buffalo, New York. Shortly after, on June 28, 2016, during an event on a movie set of Universal Studios in Los Angeles, Tesla and SolarCity (a company purchased by Tesla in the next few days for $ 2.6 billion) jointly presented their amazing innovation: an integrated system of photovoltaic tiles, connected to the new “Powerwall 2” battery, capable of producing domestic electricity and recharging the car, thus leveraging 100% renewable energy in short, a solar roof that will revolutionize the entire market. As usual, the event is redundant, thrilling, scenic, as in the usual style of Elon Musk.The International Renewable Energy Agency produced a report earlier this year that predicted up to 13 per cent of the electricity generated around the world could be done by 2030 through solar power. In addition to this, if you want to look for a replacement product, you will probably never find it, except if we want to be generous of Bicocca’s photovoltaic windows, a 2015 project, rewarded in 2016 and (almost) ready for marketing.At this point, it’s clear that the roof and battery technology could potentially open a whole new market for the company, making solar power a key component for new and existing houses. Mainly this invention aims to solve the aesthetic problem of the bulky solar panels used yet today to produce solar energy.In order to do it they are using a high-efficiency solar cell manufactured by Panasonic and covered with a “color louver film”, which allows cells to blend into the roof while exposing them to the sun above, and finally a tempered glass on top for durability. The company believes so much in the resistance of its product that Tesla tempered glass tiles are sold with endless guarantee: “These are three times more resistant than classic tiles. We are ready to offer the best guarantee possible: forever, as long as the house is standing! “says the company’s website. The animation next to it, taken at 2,500 frames per second, is part of a quality test: at the time of impact, the 5cm hail travels at 160 kms. The endless guarantee is a necessary plus considering what has been said in a recent interview by Elon Musk. 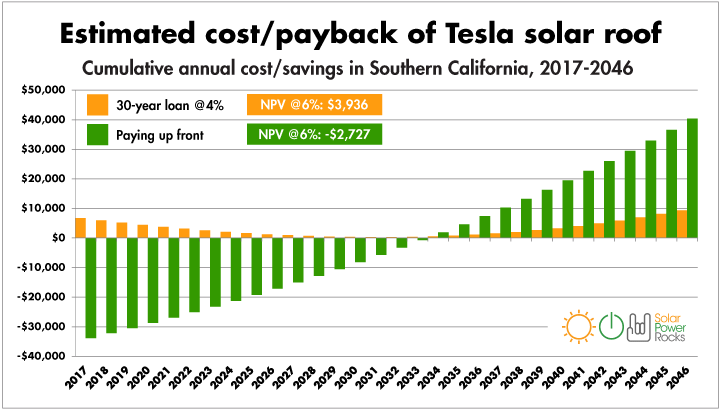 According to Tesla CEO, in fact, the Solar Roof, on balance, would be cheaper than traditional solar panels and even normal roof tiles, considering the enormous savings in electricity over the years.In this regard, the company has set up a calculator on its website providing a more or less detailed estimate of the costs to be incurred and of the achievable savings. In any case, Tesla suggests that between purchase and installation costs, cost of energy saved, and any incentives, the expense would be zeroed even earning a few thousand euros, after 30 years (15-20 years is the average life span of a standard cover of solar panels). From May 10, 2017, Tesla tiles can be ordered from many countries around the world, this is what the company announced in a tweet the night before the official launch on the market. Until that moment, exactly as it happened before the official launch of the “Model 3” electric car launched by Tesla only a few weeks before, the first and only customers were the employees of the company. The launch price is $42 for square foot of roof covering, which may vary according to the specificity of each single case. The success was instantaneous and the sales of the first two weeks were enough to fill the installations calendar until 2018.Returning to the technical characteristics of the tiles, first of all it should be said that these have a optimal functionality / aesthetics ratio, in fact they look the same as normal high-end coverage materials, but they still absorb sunlight and turn it into energy through solar cells.In this way, the energy accumulated during the day is stored in the “Powerwall” battery pack that the system must be equipped with, so as to provide the required energy and the right voltage, to avoid waste of money and technology.In short, our home would become a real small power plant able to function in a completely autonomous way.The product is offered in 4 different styles: Textured Glass Tile, Slate Glass Tile, Tuscan Glass Tile, and Smooth Glass Tile. 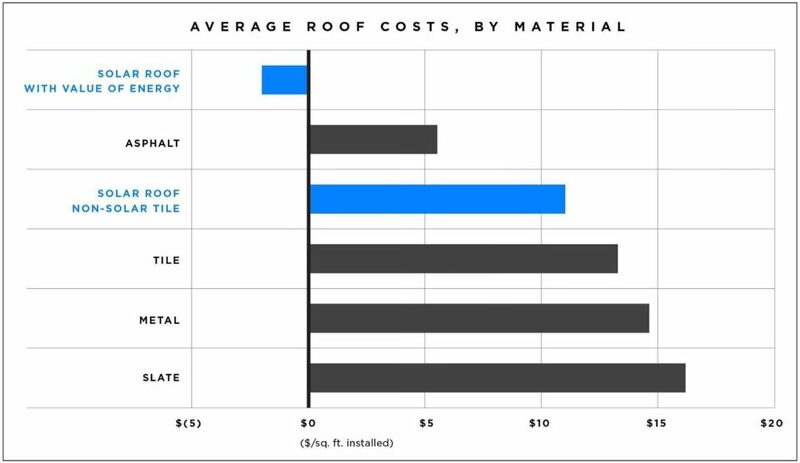 In addition to this, each roof is completely customizable since tiles with solar cells can be fitted jointly with plain tiles that are absolutely identical to each other.At last we must remember that Tesla tiles measure half the weight of the common tiles and do not degrade over time like asphalt or cement: the Tesla solar roof would seem to be the most durable and innovative roof available today on the market.There is really need for inventions of this kind in order to be able to exploit more and more renewable energies and Tesla is the best interpreter for this role. 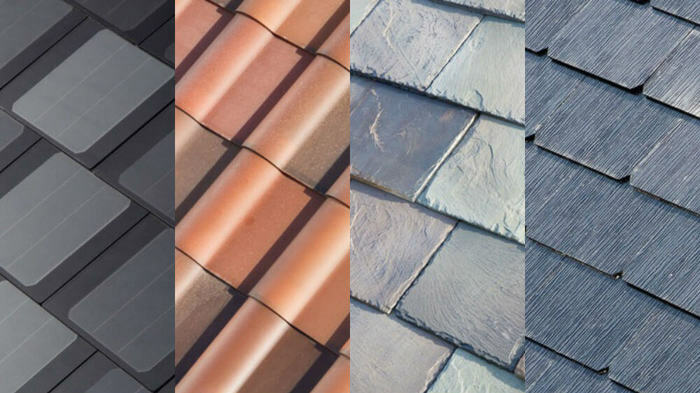 Surely it will be necessary to monitor the evolution of the solar roof over time, but all the indications are that this amazing company has revolutionized another new sector in which it is entered.In short, Elon Musk never stops to astonish and Tesla is ready to take us in the future! Cameras will be the big battlefield of the coming years in the mobile market. It is not only to shoot better selfies or capture breathtaking views but it will enters in many different field: building, furniture, web and urban browsing, exploration. This is an extremely large market, Apple and Google are the most important players and no one intend to lose points. The main innovation is the ability to unlock the phone using an infrared sensor that recognizes the face of the user. The iris scanner is integrated into the Samsung Galaxy Note 8 and Samsung Galaxy S8, Apple has also came in the scene with the new iPhone X and has introduced this new login system in the iPhone X. Phone’s all-glass front leaves no room for a home button, Apple is giving up Touch ID in favor of a facial recognition system. Everything will go through a smartphone, an item that everyone has in their pockets. This is the reason why the potential of this technology is of great interest to companies and developers. An example is IKEA Place, an application made by the renowned Swedish chain of home and furnishing stores. The décor becomes virtual and real at the same time. 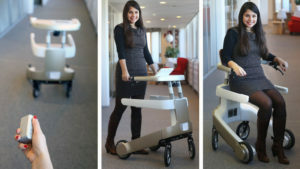 Just choose a product (an armchair, bed, bedside table) and using the smartphone camera this is placed anywhere we want. But the applications, as said, can be many. Another example is the exploration of urban environments: pointing the camera to a restaurant, a hotel or a museum will be enough to have immediate opening and closing times, ticket price and possibly user reviews. Not in a long time, millions of people will soon depend on face recognition to check their e-mail, send a text or make a call, it will be fast and easy to use. Nowadays face recognition is already used around the world to examine, investigate, and monitor. In China is used to identify and publicly shame people for the crime of jaywalking. In Russia, face recognition has been used to identify anti-corruption protesters. In the United States, more than half of all American adults are in a face recognition database. It can be used for criminal investigations. Governments are not the only users of face recognition. In daily life we can have examples of face recognition. Retailers use the technology in their stores to identify suspected shoplifters. 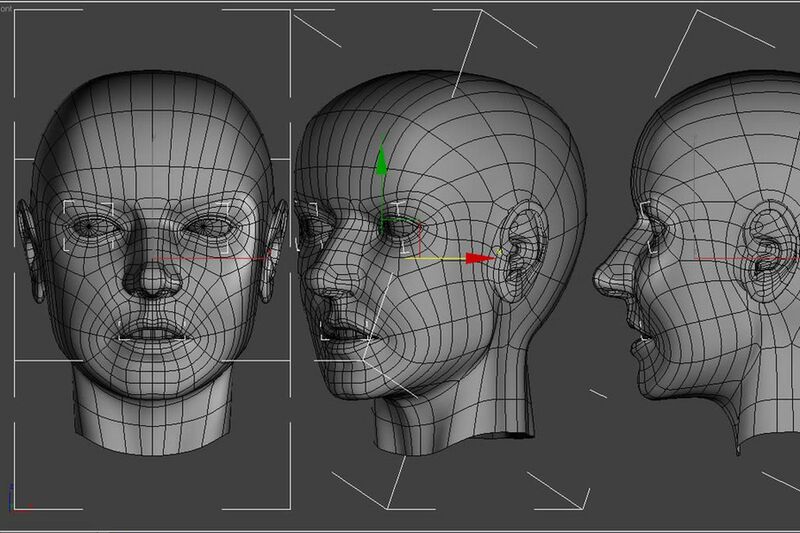 Social media applications increasingly integrate face recognition into their user experience. All smartphones will probably include sensors for face, iris, and fingerprint recognition which were a rarity shortly time before. A lot of people in the coming months will use a face recognition scan every time they want to check the weather, draft a tweet, or make a rare actual phone call. But even as we embrace its conveniences, we should remain suspicious of the many ways face recognition is used today. Infact as we choose to explore the conveniences face recognition can offer, we must be vigilant to its risks. It can change the way we see things around us and make more actions quicker in our daily lives. However has the facial recognition systems been easily fooled by photos or masks? Also if even though Apple and other developers have reassured us about this, there may be risks related to the privacy and security of the collected data, which is becoming increasingly complex and difficult to handle, even because of the lack of common standards. It may be a major privacy concern, and one many users don’t think about it until it’s too late. Philip W. Schiller, vice president of Apple for marketing claimed the system required the user’s attention to properly function, saying, “If your eyes are closed, if it’s not lined up, it’s not going to work.” The iPhone X refuses to unlock as long as the subject’s eyes are closed. Moreover if you are kidnapped by criminals, they won’t be able to guess your password, but they would be able to hold the phone up to your face until you pass a Face ID scan. However we can say that what does not interest in Apple is instead the interest in gathering data and mass targeting infact this feeds most of the web companies. The home delivery sector of ready-made food or food products has become one of the most vibrant investment areas for venture capitalist around the world for a couple of years from now. Today the market is in the wake on the United States as well as in Europe, so much so to speak of a fight for supremacy in the delivery sector. In this already saturated market will soon come also Facebook. Facebook ha just annunced that users in the USA can now order food for takeout or delivery using the Facebook mobile app and the websit. Facebook hasn’t created its own answer to the most important food delivery apps. The company is partnering with existing services GrubHub, Delivery.com, DoorDash, ChowNow, Zuppler, EatStreet, Slice, and Olo, and will now link out to those food ordering businesses for restaurants that support them. Ordering a takeaway is pretty simple: we should search the ‘order food’ tab in the Facebook app or website. This will bring up a selection of restaurants in your local area that offer delivery or pickup services. Hit ‘start order’ and you’ll be directed to food delivery services. So we can order the food and then pay it. Why order a takeaway through Facebook? The most important reason is that probably people are already on Facebook anyway, figuring out what to eat and seeing what friends say about local restaurants. The speed which you can order food through Facebook goes against the idea of being in touch with people through Facebook messenger. What’s important for Facebook is that people will be more likely to spend a little more time on the platform than before. Facebook is so working to capture another piece of our attention and of our time. Facebook’s entrance into a market that is not its own could create problems for the smaller startups that are growing up in this field, especially if Facebook makes arrangements with the major startups. Furthermore we must consider that this is a fairly saturated market. The entry of Facebook could cut away some minor players as happened with Maple. So this is not a new situation, already some years ago Maple shutted down because of the entry into the market of startup like Deliveroo which can offers a cheaper food in a less time. Are we sure the quality offers it is better? Unlike Maple, which prepared its own dishes, Deliveroo delivers food made in restaurants. Maple’s owners said about that: “they have a shared vision in reference to delivering great food to your door, and fast.” They would not comment further. Finally it is clear that Facebook is increasingly part of our lives and it is now present in the most of our actions. 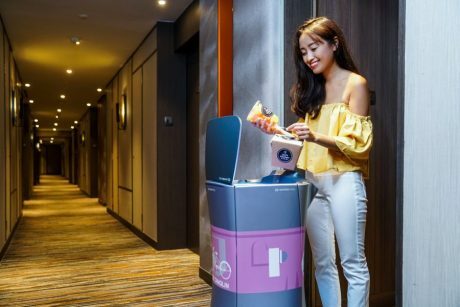 It does not surprise me that it can now also be used for delivery food. It is clear how with this novelty Facebook could take the place of other minor palyers who are currently on this market. But the negative aspect in my point of view is that in this way, focusing on food, puts an extra step in its all-encompassing strategy, aimed at getting us out as little as possible from the site! Instead, I think that detaching ourselves from “virtual” life sometimes would not be bad.